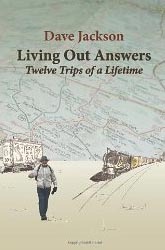 Living Out Answers – Twelve Trips of a Lifetime by Dave Jackson, is one of two indie books I recently read for pleasure (others I read for one of my few paid writing gigs). In the interest of full disclosure: I almost know the author. We’ve never met, but Jackson’s the father of a good friend who gave me the book as a gift. This is a memoir based on trips, yup 12 of them, that he began taking when he turned 50 in 1979. He kept journals of the adventures which are the book’s foundation supplemented by recent afterthoughts. The trips include finding a way to spend time on the Mississippi River, to working for a circus, to learning about coal mines in West Virginia, along with nine others. He hitchhiked, hopped trains, hiked, rode in the cabs of big rigs and developed sea legs on boats. Nearly as interesting is how the book evolved: Jackson’s granddaughter was prompted by a photo which led to discussions about the travels. Others entered the picture offering advice and encouragement. Although the book became a family endeavor of sorts, the stories are Jackson’s. Jackson embraced the new opportunities and experiences no matter how exciting, frustrating or unpleasant, but there was always the safety net of a comfortable lifestyle awaiting him after each exploit. What’s most impressive is that Jackson made these journeys at a point in his life where many think self-reflection is either unnecessary or inconvenient. He demonstrates neither is the case.